Due to higher quality demands from the welding market the seamless welding wires offer a great advantage. Hydrogen <3 ml/100gr, destortion free feeding and high current capacity are just only a few of the advantages of these type of wires. 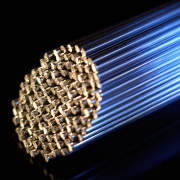 The production of this welding wire starts with a seamless high frequncy welded 12 mm (1/2 inch) tube followed by filling with agglomerated powder by vibration.